There’s talk, and a lot of it, about a new political party being set up in Ireland but the reality is that any such development remains a way off yet. 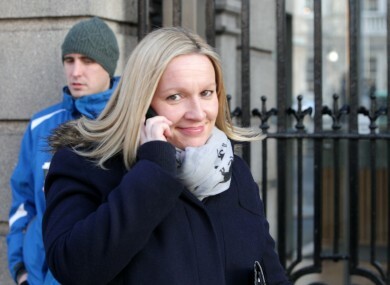 Lucinda Creighton is seen as the driving force behind the establishment of any new political party in Ireland. WITH MANY VOTERS taking the view that the government has failed to bring about a new politics and the ‘democratic revolution’ that had been promised, independents and smaller parties have been the beneficiaries of voters’ anger and disillusionment. The results of last months local and European elections were notable primarily for the rise of Sinn Féin and the re-emergence Fianna Fáil - to the detriment of the government parties – but we shouldn’t forget that it was ‘Independents’ Day’ also. Hundreds of independent local election candidates were the beneficiaries of the voters’ shunning the establishment. To take one example, the Independents’ Network, a loose alliance of non-party candidates, saw a credible nineteen of its 36 members elected – two MEPS and seventeen councillors. “A very clear mandate has been given to Independents, from across the political spectrum, to represent the interests of those who chose to elect them in a way that is entirely different from party representation,” one of the networks founders, Catherine Murphy, said last week. The emphasis on independence, particularly from a party whip system, is obvious, but even Murphy admits that members of the network have signed up to a set of common principles, a manifesto of sorts, that focuses on human rights, equality, democracy, community and sustainability. All of which gives rise to speculation that a new political party is just around the corner, claims dismissed by the group in the past. While polls consistently show an appetite for a new party they do not necessarily say what kind of party is needed, nor do they indicate whether voters would actually vote for that party. Perhaps they’d just like the option to. Of course much of the new party talk focuses on the activity of the Reform Alliance, the group of ex-Fine Gael TDs (some of whom remain party members it should be noted) who lost the whip over the abortion vote last summer. Today, the Irish Times reports that detailed plans for a new party are being drawn up and discussions are taking place with politicians inside and outside the Dáil who could join up. Reform Alliance sources have indicated previously that a new party would have to happen after the elections that have just happened and before the next general election in 2016. With that in mind the period between now and the end of 2015 is particularly crucial. The moves have apparently started but members of the Alliance who we spoke to this morning sought to downplay talk that anything is imminent. “It was briefly discussed earlier in the year,” one RA member, who declined to be named, said, adding there had been no such discussions since. “I haven’t seen any detailed proposals for a new political party,” another RA member said. In addition, members of the Alliance appear to want different things. Lucinda Creighton, its most prominent member, has said all along “there is a space” for a new party and she seems likely to attempt to occupy that space, but she has made no definitive moves as yet. Other members of ‘The RA’ such as Dublin North East TD Terence Flanagan and Wicklow TD Billy Timmins may drift back towards Fine Gael while one, Denis Naughten, has already said publicly he will definitely run on an independent platform in the next general election. There has been a suggestion that discussions are happening with people outside of Leinster House, but this happens all the time. We reported in February that independent deputy Shane Ross had canvassed his close advisors on how they felt about the idea of a new political movement. But nothing definitive has come of it. Other prominent public figures like Declan Ganley have said in the past that the need for a new party is “obvious”. While former tánaiste Michael McDowell has never been far from the airwaves or the newspapers in airing his views about the need for a new party. But nothing definitive has happened. In another move that doesn’t exactly bolster the theory that a new political party is imminent, TheJournal.ie has learned that the Reform Alliance never actually registered as a third party with the Standards in Public Office Commission (SIPO) which would have allowed the group to raise funding for research and policy development. This move was seen as a prelude towards a new party, but it never actually happened despite being widely reported by this website and others. It’s believed that the rules around ‘third parties’ were seen as too cumbersome by RA members as they would have been prevented from using their Oireachtas allowances as donations towards funding the collective work of the group such as its recent fair value lending policy and forthcoming political reform proposals. And so while the talk remains, and the speculation will go in the political bubble, the reality is that any talk of a new party remains just that. Email “There's a lot of talk, but a new political party is not imminent. Here's why... ”. Feedback on “There's a lot of talk, but a new political party is not imminent. Here's why... ”.